Prominent & Leading Manufacturer from Jamnagar, we offer pillar tap for hotels. 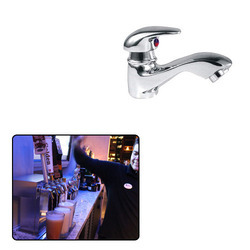 We have with us Pillar Tap for Hotels that are widely used in homes, hotels, farm houses and resorts. All our products are developed at par with international quality norms, using premium raw material and latest technology. Moreover, our taps are available in various designs, shapes and sizes at affordable prices to meet the specific demands of esteemed clients. Looking for Pillar Tap for Hotels ?